MUNICH -- Ford of Europe said it was Europe's second biggest selling brand after Volkswagen in 2008 despite its new-car sales falling by 7.4 percent in its major markets. Ford's sales in its main 19 markets fell by 115,200 units to 1.44 million last year, the company said Wednesday. But the carmaker increased its market share by 0.1 percentage points to 8.6 percent helping it to overtake General Motor's Opel brand as the second biggest selling marque in western Europe. Opel's market share fell from 8.5 percent to 7.8 percent in Western Europes in the first 11 months of the year. In all 51 of its European markets, Ford's sales dropped by 6.1 percent to 1.78 million during 2008. 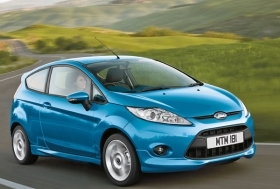 The successful launch of the Fiesta small car helped the company increase market share, Ford said. The Fiesta sold 61,000 cars in its main European 19 markets in November and December, and is now Ford's second biggest seller after the Focus lower-medium car. Sviggum said he was delighted the Fiesta had got off to a strong start and had become the best selling car in the UK for both November and December. The UK remains Ford's biggest European market, with 2008 sales of 406,100 units, down 38,500 from 2007. Germany was No. 2 with sales up 6,200 to 241,400 cars. Italy was No. 3 with sales down 33,700 190,300 cars. Fuel-efficient small cars such as the Fiesta and the Ka minicar, which was also launched last year, put Ford in a strong position, Sviggum said. Said Sviggum: "This gives us real confidence that the Ford brand will emerge even stronger when the economy rebounds."